Well, maybe I should just call it Ordinary Lime Pie, because obviously I am unable to get key limes here in Manchester, but that doesn't make the pie any less good, so I'll just stick with the better known and let's face it better sounding name. When I was 16 I went on a three week road trip around Florida with my sister. That's when I discovered Key Lime Pie. I fell in love straight away. 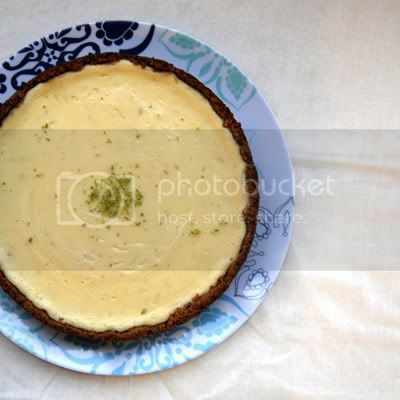 Key Lime Pie is not all that common here in the UK, so on the rare occassion that I do see it somewhere I'll order it. Why it has taken me 18 years to try and make my own, I have no idea. All I can say is now that I have made it, I won't wait another 18 years to make it again. It's really easy, fresh, tangy and sweet at the same time and best of all it takes me right back! Not that I really want to be 16 all over again. I definitely prefer 34! Oh and if you don't know what to do with the left over egg whites, try making Coconut Macaroons. I have no idea where the recipe came from. I wrote it down on a piece of paper years ago. While it's melting, place the biscuits in a large food bag and bash them or roll them with a rolling pin until you have fine, fairly even crumbs. When completely melted, take the butter of the heat, add the biscuit crumbs and stir until well mixed. Place the crumb mixture into a 26cm pie dish and press firmly down and up the sides with your fingers, until you have an even thickness. If like me you don't have a pie dish, you can use a springform pan and just press the crumbs about 1 1/2 to 2 fingers width up the sides. Bake on the middle shelf for 10 minutes, until golden. While the biscuit base is baking you can make the filling. Place the egg yolks and lime zest in a large bowl and whisk for about two minutes with an electric whisk. The yolks should start to thicken a bit. Add the condensed milk and continue to whisk for about 5 minutes. Finally add the lime juice and give it one final quick whisk to combine. Remove the crust from the oven and carefully pour the egg mix into the middle, making sure it spreads out evenly. Place back in the oven and bake for 15-20 minutes, until set but still springy. Remove and allow to cool. Once cooled completely wrap in cling film and refridgerate until you're ready to serve it. It went down rather well at our bring-a-dish dinner party, or potluck dinner as it's known in America. I was hoping for a left-over slice to take a nice daylight picture of today, but all I got the chance to photograph was the empty plate instead. I guess that's better in a way though, isn't it?! If you regularly visit this blog you will have read that I am currently on a bit of a drive to bring down the amount I spend on food every month. That doesn't mean I eat less well or boring food, if anything I think it has had the opposite affect and I have been inspired to look for more new recipes to try and cook. One of the key things I have found to help me with this, is sitting down and making a weekly meal plan and shopping list. It stops me from doing loads of little trips to the shops that end up costing more, from ordering take aways because I can't be bothered coming up with something made from the random ingredients left in my fridge and pantry and from spending loads of money every week on over-cooked and over-priced food in the canteen at work because I have not thought of lunches. The other great thing of course is that it also stops food waste and means I'm also doing just a little bit more for the environment. I usually sit down for an hour or so on Sundays to browse the web and flick through my collection of cookbooks to come up with a plan for the week. I then spend some time checking what I have already in and what I need to add to my shopping list for Monday's big shop. Now you might say that you don't have the time to do this and also find it difficult to decide what to cook because you might either be very indecisive and find that there is far too much choice or you feel you lack the confidence and experience in the kitchen. This is where Hello Fresh come in and help! 1. You select the number of meals you'd like delivered and the amount of people in your household. 2. Your recipes and groceries will be delivered on Monday evenings between 5pm and 9pm. 3. You can get stuck in and discover the joy of easy to cook, quick and well-balanced meals at home. You won't need any fancy kitchen equipment, masterchef skills or loads of time. The recipes have been put together by chefs and nutritionists and should not take you more than 30 minutes to make. Isn't that brilliant?! It also is really good value, costing as little as £49 per week for five meals for two people, or even less if you order for four or six. All that plus locally sourced products and optimised delivery routes also means a reduced carbon footprint. What's not to like? I love sweet vegetables, butternut squash being one of my favourites. So when I saw a recipe for Squash, Sweet Potato and Lentil Salad on We Don't Eat Anything With A Face a couple of weeks ago I bookmarked it straight away. 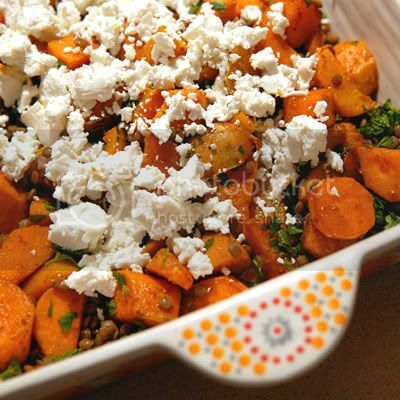 Sweet vegetables, warm spices, earthy lentils and salty cheese, what more could I want? Lucy and Yuri liked it, too. The other great thing about this recipe is that it fits in perfectly with my focus on keeping the budget in check by concentrating on frugal but not boring food. Not only are non of the ingredients overly pricy, but it's a perfect meal for left-over lunches, as it can be served warm for dinner and cold for lunch the next day. The salad leaves start wilting when you top them with the warm squash, sweet potatoes and lentils. So if you are not planning on eating it all and do want to save some left-overs for the next day, just take some out and set it aside before serving the rest on a bed of salad leaves. You can then add more greens the next day to avoid wilted, limp salad leaves spoiling your meal. 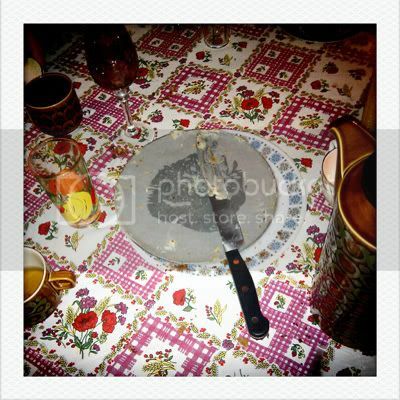 Or like me serve the salad leaves in a seperate bowl and let everyone assemble it on their plates at the table. 100g soft goats cheese, crumbled. Heat 3 tbsp olive oil in a large baking dish. Add the spices, butternut squash and sweet potato and stir to mix well, making sure the squash and potatoes are properly coated with the oil and spices. Roast for 35-40 minutes, turning once, until soft and and beginning to caramelise. Whilst the veg is in the oven, boil your lentils in salted water. Timings vary depending on which lentils you use. Check the packaging for timings. Drain and set aside to cool a little. Add the balsamic vinegar and stir. Allow the vegetables to cool for 10 minutes or so as well, before adding the lentils. Serve warm (or cold) on a bed of salad leaves. Top with crumbled soft goats cheese. Smoked Mackerel is one of those things that I regularly put on my shopping list even if I have nothing specific to make with it in mind. I just like having some in the fridge as it's not only healthy, but also delicious and a great additin to a salad, or what my friend H. calls a deli dinner (the kind of dinner where you just have little bits of loads of different stuff, kind of buffet style) and it is also quilckly turned into a pate. I guess though, that one of my favourite ways to have it is as a filling for a sandwich. 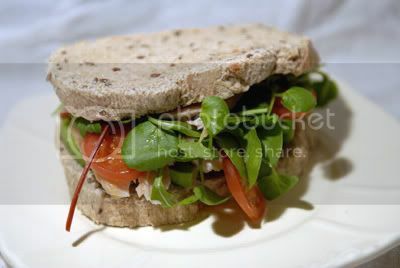 When I know that I have a mackerel sandwich in my lunchbox, I spend all morning looking forward to my lunch break. The other night I made a Smoked Mackerel and Avocado Sandwich to go with the Pea, Mint and Lettuce Soup and together they made a delicious and filling dinner. Butter your bread or roll. Top with flaked mackerel, acocado slices, sliced tomatoes and salad leaves. Season with freshly ground balck pepper if desired. 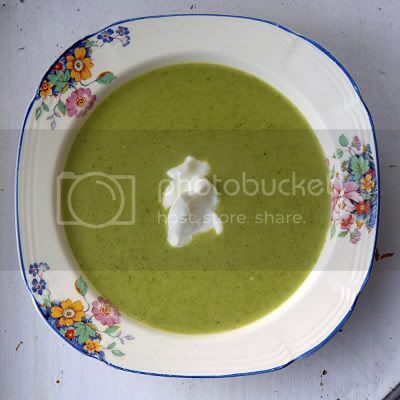 Okay I admit, the words lettuce and soup together might sound strange. For most of us lettuce is there to be eaten raw in salads, but sometimes it actually works really well cooked. You should try it sometime. This recipe is based on one from an Avoca Cookbook, but I have changed it quite a bit, as I felt the original lacked flavour. Do you sometimes find that you really like the food served in a cafe or restaurant, but then when you buy their cookbook the recipes don't work quite as well?! If you're Irish or you have been to Ireland you probably know about Avoca. Not the small town in Co. Wicklow, but the shops. They sell nice stuff and most of the stores have a really nice cafe/bistro attached to them. Everything I ate there, especially the soup and cakes I really enjoyed, but I have now tried soup twice from the cookbook I bought and had to doctor both recipes quite a bit to stop them from being bland. Well the my 'doctored' version not only looked great (that's if you like bright green) it also tasted really good, was pretty quick to make and just hit the right spot on a cold January day. In a heavy based saucepan melt the butter over medium heat togther with the olive oil. Sautee the onion until soft and translucent stirring regularly. You want to sautee them slowly, as they are not supposed to go crispy and brown. Add the shredded lettuce and saute for a couple of minutes before adding the peas. Continue to cook for 5 minutes or so. Remove from the heat and liquidise with a stick blender or by carefully puring it into a liquidiser. Remove from the heat before finally stirring in the creme fraiche. Sprinkle with mint and serve with your favourite crusty bread. Most weekday mornings I just have a bowl of cereal, porridge or a buttered crumpet with a cup of Earl Grey tea for breakfast. Today though, the combination of working from home and having planned soup for dinner, meant that I felt like having something a little more substantial and exciting to start the day off with. When I checked my fridge this morning I found some small avocados that I bought last week and that were getting quite ripe, so I decided to have them on toast with a poached egg to top it all. Delicious. I guess this isn't really a recipe, but I'll share my method of making poached eggs with you. I have been given some silicon egg poachers for my birthday, but in case you don't have any don't worry it isn't really that difficult to poach eggs without them. Heat the water with a dash of vinegar in a frying pan until just simmering. Crack one eggs into a small cup, being careful not to damage the yolk. The eggs should be really fresh, old eggs don't poach well. Now take a spoon into one hand and the cup containing the egg in your other. Swirl the water in the frying pan, so that you create a bit of a whirl pool effect and bring the cup close to the surface of the water before you pour the egg from the cup into the middle of of the whirling water. That way the whites get 'swirled' around your yolk and it stops your egg from spreading out too much. Your pan should be big enough so that you can poach two eggs at the same time. Just repeat the previous step adding the second egg, making sure it is not too close to the first one. Keep the eggs on a very low simmer for around three minutes. If you like your yolks a bit firmer, you might want to give them four minutes. Remove from the pan carefully with a slotted spoon and place onto a plate lined with kitchen towel to drain. 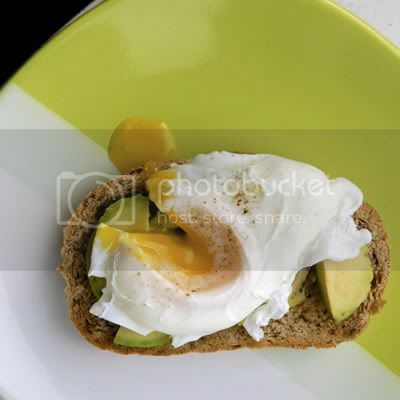 Arrange the sliced avocado on top of your hot buttered toast and top with a poached egg. Season with salt and freshly ground pepper as desired. As you might have read in my previous posts, I'm on a bit of an economy drive. For a few months now I've been keeping a houshold book and realised that I spend a lot of money on food that I either never cook, which of course is not just bad for the environment, but also for my bank balance and that I spend far too much on bad canteen food at work. Of course as a food lover that doesn't mean that I would eat less well or bad food to save money. It also doesn't mean that I don't still peruse websites such as Fine Food Specialist and order some Chinese Flower Tea as a special treat to myself. In fact if anything I think I'm eating better, as I plan meals for the week ahead, avoiding waste and making sure that I include seasonal produce and plenty of healthy options instead of opting for a lazy after work take away. One of the seasonal fruits available here in England at the moment is Forced Rhubarb, which is beautifully pink and sweet and such a nice treat on these cold January days when you might just be getting tired of the other local seasonal produce available, such as cabbages and kale. I guess that's the reason why this weekend's Guardian featured a couple of Dan Lepard's rhubarb recipes. The Rhubarb Upside-Down Cake looked so good that my friend H and I got to work in the kitchen yesterday afternoon. Delicious sweet and tangy rhubarb and warm spices, how could that not be good. If you cannot get the early forced rhubarb where you live, just wait a few months and make it with normal rhubarb. I promise it'll be worth the wait. By the time the cake was out of the form it was getting a little dark and I also only had my mobile phone camera, so the pictures might not fully do it justice. 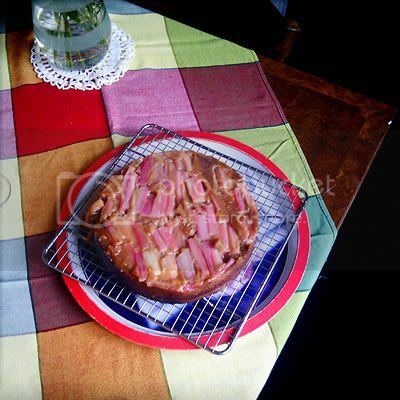 The first picture shows the beautifully pink, uncooked rhubarb before pouring the cake batter into the pan. Line a 20cm springform cake tin with a sheet of buttered baking paper. 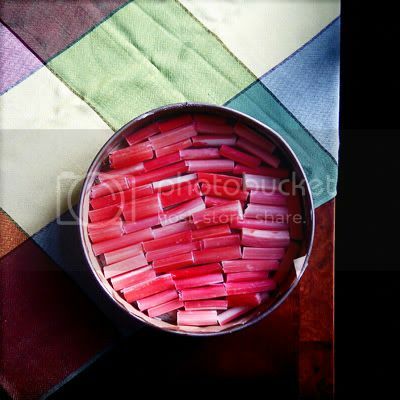 Place the rhubarb pieces in lines across the bottom of your springform tin. Sprinkle with caster sugar and lemon juice. In a saucepan over medium heat, bring the muscovado sugar, black treacle, honey and spices to a boil. Take the pan of the heat and pour the mix into a large mixing bowl. Add the butter and the sourcream and stir with a wooden spoon until well mixed. Add the egg and beat in, followed by the flour, ginger and soda bicarb. Remove from oven and set aside to cool for about 15 minutes or so. The carefully turn the cake and take off the foil carefully. This is good served with some creme fraich or vanilla ice cream. When I came across a picture of this recipe on pinterest the other day and then looked at it on Egg and Soldier, I knew I would have to try it. 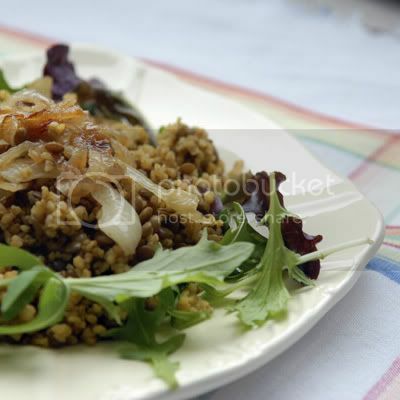 I had heard of Mujadara before, which is basically the same apart from using rice with the lentils, but I do really like bulgur and am always looking for new ways of having it. In a way this is such simple food, but it is full of flavour and you know you are being good to yourself when you're eating it. I had mine warm with some Roasted Curried Cauliflower (I'll post that soon) last night and a spoon full of thick Greek Yoghurt, but it was equally good today as a cold lunch salad. I'm really looking forward to experimenting with this as a basis for salads, adding some chickpeas, cucumber, fresh corriander and tomatoes for example. I think it'll be really versatile. In a large heavy based sauce pan bring the stock to a boil. Add the tomato paste and all spices except the salt and pepper. Add the lentils, re-place the lid and simmer for about 15minutes. Whilst the lentils are simmering, heat some olive oil in a large frying pan. Add the onions and fry over low to medium heat for about 30-35 minutes, stirring often, until they’re soft and brown. After 15 minutes check the lentils, add in the bulghur, put the lid back on and cook over very low heat for another 10-15 minutes. Remove from heat and rest for another 10 minutes or so, after which time the bulgur should be tender and nicely plumped. Stir in the olive oil and season with salt and pepper to taste. 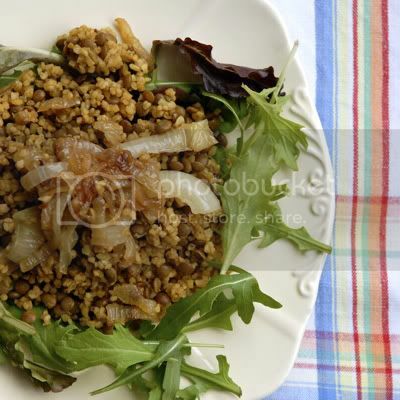 Serve the lentils and bulgur topped with the onions and serve with thick Greek yogurt and salad. I have been on an economy drive for a few months now. Well, I guess some people would still consider that I spend way too much on non-essential stuff and indulge in luxuries, such as a pre-Christmas New York trip and my twentieth or so (who counts) pair of shoes, but we all have things that for us are priorities, thangs that make us happy and on which we do not want to cut back. Other things however I am trying to cut back on and one of those is food, funnily enough. It seems like a bit of a contradiction, as I obviously love good food, otherwise I wouldn't be writing this blog, but cutting back for me doesn't mean starting to buy cheap meat or low quality ingredients for example. Instead I'm trying to waste less and consider what I buy more. That means making weekly meal plans and taking home-made lunches to work, rather than buying over-priced, over-cooked food in the canteen. It doesn't have to be expensive to eat well. But, I guess we all know those nights where we don't like using what we've bought in and instead we nip out to the over-priced local late-opening shop to buy something different for dinner or even order a take away. Well, it's those I'm trying to avoid. I'm trying to stick to what I have planned, which also means that I throw a lot less food away because it has gone smelly or slimy in the depth of the fridge. It seems to be a winning plan all around. I found the recipe for Loaded Sweet Potatoes with Chili Beans on A Couple of Cooks. It's good food, that's easy to make, tastes wonderful, fills you up and the ingredients don't cost much at all. 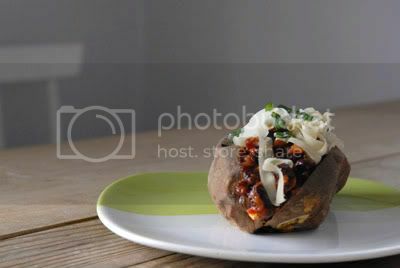 Plus I am already looking forward to having the left-overs for lunch tomorrow and if you can't bear the thought of eating the same things two days in a row, why not try the beans on a normal baked potato, or with rice or as a Quesadilla filling. I have made a couple of additions to the original recipe, so here's my version. Preheat the oven to 230C/Gas 8. Wash the sweet potatoes and prick them with a fork. Place in the oven to bake for 40 minutes, until tender. Heat the olive oil in a heavy based pan. Sweat the onions over a medium heat until translucent, but not brown. Add the tomatoes, beans, chili powder, cumin, stock powder and sugar and simmer for about 20 minutes until thickned a little. Once the sweet potatoes are tender, remove them from the oven and cut them open. Top with chili beans, shredded cheese, sour cream, green onions, and fresh corriander. 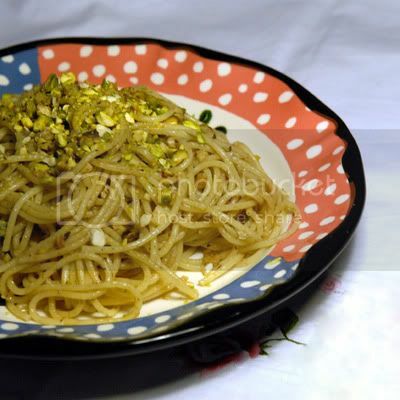 I had some left-over anchovy and nothing much else in the fridge, so went searching for something to make and found this recipe for Spaghetti with Anchovy and Pistachio on Cook is Good blog. I guess it's a variation on the classic Sicillian Pasta with Anchovies and Breadcrumbs. My French is more than rusty, but with a little help of google translate I managed to get there in the end. I don't think it'll become my favourite ever spaghetti dish, but it's a good one for a quick midweek dinner, as it is more or less done in the time it takes to cook the spaghetti and the saltiness from the anchovies and crunch from the pistachios make for an interesting dish. If you like your pasta slathered with sauce this isn't one for you though. Cook your spaghetti al dente. While the spaghetti are cooking, place the anchovies and oil they come in in a heavy based saucepan over medium heat. Reduce the heat to low and add the garlic. Sautee until the anchovies have falled apart and set aside. Drain the pasta, reserving some of the cooking liquid. Add the spaghetti to the pan with the anchovies and return to a low heat. Stir until well coated and leave on the heat for a couple of minutes, adding a little of the cooking liquid until your 'sauce' has the desired consistency. Add the pistachios, keeping a few aside to sprinkle over the top once plated. This French Onion Tart is an adaptation of the French classic Pissaladiere. The recipe comes from Leon's Book 3 - Baking & Puddings, it uses spelt flour in the pastry, but otherwise is not much different to other Pissaladiere recipes I have seen. I like savoury tarts, especially if the main ingredient is onion, so when I saw the recipe and needed something to take along to the New Year's Eve dinner, I decided to give it a go. I doubled the amount of pastry and topped the second tart with onion and goat's cheese and both went down well. Here is the recipe as it is in the book. To make the pastry combine the flour, salt and sugar in a large bowl. Cut in the butter with a knife (I use my hands, but if you have very warm hands using a knife is a good idea). Leave larger chunks of butter than you would think (about the size of a garlic clove) to make the pastry more flaky. Drizzle in the ice water and bring it all together in a ball. Wrap in clingfilm and let it rest in the fridge for at least 30 minutes. To make the topping heat the oil in a heavy-based sauce pan and add the sliced onion. Sautee over a medium heat, stirring occassionally. You want them to caramelise, but soft rather than crisp. Once cooked about 10-15 minutes (it says 7-8 in the book) add the vinegar and 2tsp of water. Sprinkle with thyme and set aside to cool. Heat oven to 160C/Gas 3. Pit and break up the olives a little. Transfer to a baking sheet and spread the cooled onions out, leaving a small boarder all round. 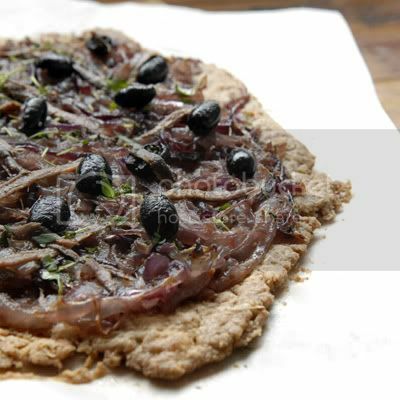 Top with olives and anchovies and season with salt and black pepper. Brush the edges with the beaten egg and bake in the oven for 25-30 minutes. Happy 2012! I hope you've had a good start to the new year so far and wish everyone reading all the best for a prosperous and healthy year ahead. I got together with friends to see out the old and bring in the new. My friend Sarah opened up her home to us and we all brought drinks and food to share and be merry. To me the perfect way to start the new year: food, drink, friends, laughing, dancing, Jools Holland countdown, midnight hugs and kisses, early hours taxi hunting and a quiet minute before finally falling into bed. One of the dishes I took along was Smoked Mackerel Pate. So easy and quick to make. I also went to a little more effort and made Pissaladiere, but will share that recipe another day. 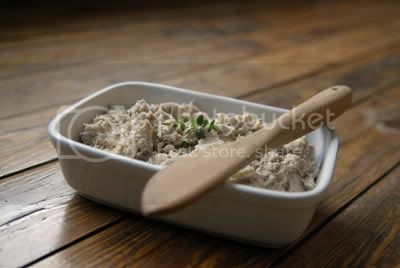 Remove the skin from the smoked mackerel and flake it into a bowl. Add the mascarpone and using a stick blender or food processor, puree until combined smooth.